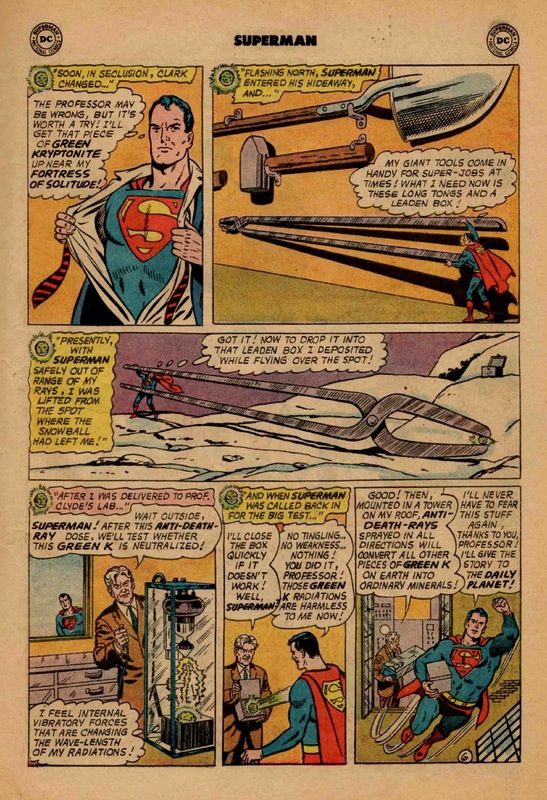 In the final pages of this middle story from Superman #176 from 1965, we have learned how a chance encounter with our (storytelling) piece of Green Kryptonite also inspired Superman to build his now-canon Fortress of Solitude in the Arctic's frozen wastes. 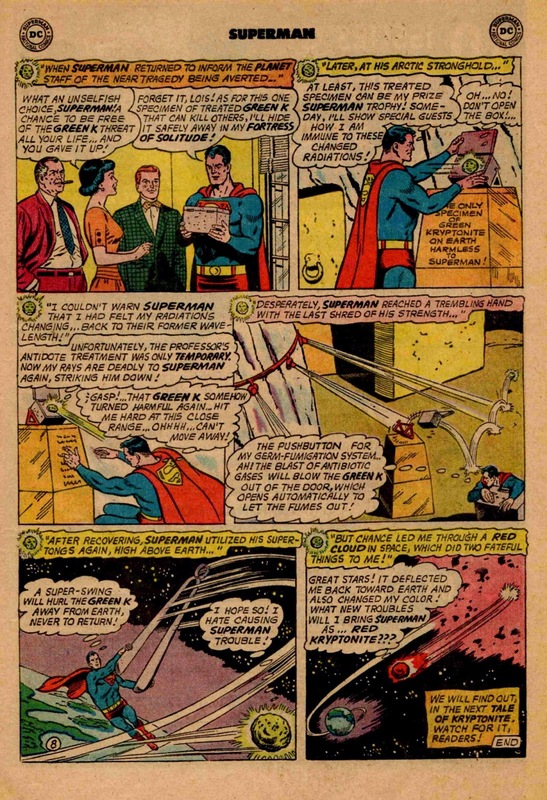 When Professor Clyde of Metropolis developed a ray that could change the radiation (and therefore remove the deadliness) of radioactive ores/minerals, Superman went back and snatched that piece of Green K for an experiment on the most dangerous thing (to Kryptonians) on Earth. After the experiment, Clyde holds a lead box towards the Man of Steel and lifts the lid. 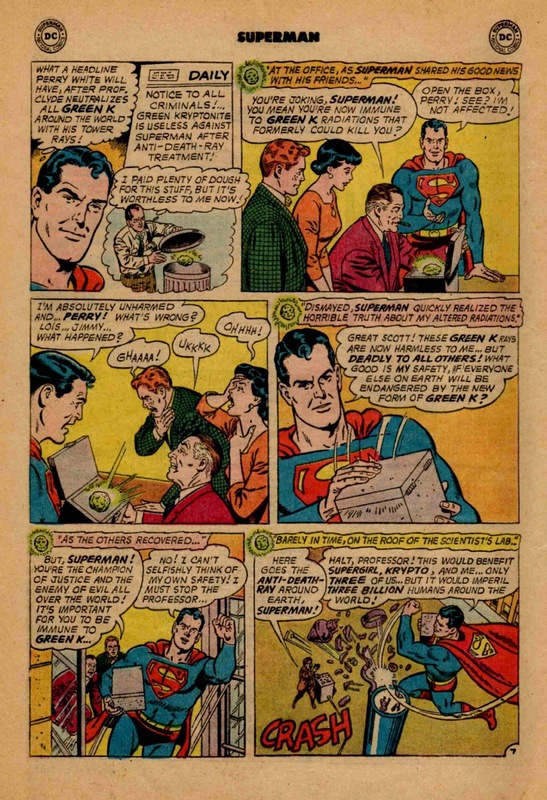 When the Green K has no apparent effect on Superman, Superman snaps the lid shut and heads off the share his exciting news with his friends at the Daily Planet. Meanwhile, Professor Clyde has built (apparently between panels) a tall radio-broadcast tower, from which he will shoot out his Kryptonite-changing rays worldwide. Just think, Supes imagines ... think of all the bad guys in the world realizing that the Green Kryptonite they paid big bucks for, is now useless as a weapon against Superman, Supergirl, or any Kryptonians! Next, we have the punchline of this story. When I reflect that in the Silver Age, stories were often spun from a single odd or dramatic image, I think the third panel on this page might have been the impetus for this entire marvelous tale. Also the splash page for this story! What irony! The one element deadly to Superman is now ineffective on him, but makes normal Earthlings sick. Our noble hero now comes to a decision. The status quo must be preserved! This is a prerequisite for nearly all episodic storytelling, but this time it's a moral choice. Superman must weigh his possible immunity to Kryptonite, against the danger to the peoples of Earth. Being the hero that he is, he decides that he doesn't want the Earth burdened with an unknown amount of environmental poisons. So, in a dramatic move shown from a dramatic visual angle, Superman barely makes it to the top of Clyde's tower in time, smashing the broadcasting device just as it's being switched on. Wait, Superman! The sentient Kryptonite (that's narrating this tale) has felt its wave-lengths changing back to its previous lethal state! Don't open that box! And, in a satisfying call-back to its introduction on Page Five of this tale, Supes thinks quickly and is able to use the Super-Fumigation system to blow the deadly rock out the door, "which opens automatically to let the fumes out!" With the benefit of more experience with pollution than was common in 1965, dear reader, aren't we prone to find fault with Superman's fumigation system? If a deadly germ or gas got loose in Superman's Fortress, what's the plan? Why, SWEEP IT OUT THE DOOR! It's a kind of Super-NIMBY! That aside, we close this tale with Superman tossing this treacherous piece of Kryptonite out into space ... another example of foisting our problems on the greater environment. Out of space, out of mind! Except for the clincher ... a Strange Twist of Fate turns this piece of Kryptonite into Red K ... and sends it back towards Earth! Can I get a DUN-DUN-DUN? Yup, all the elements of a great Silver Age Superman tale are here! See you Monday for the next pages of this great comic book. 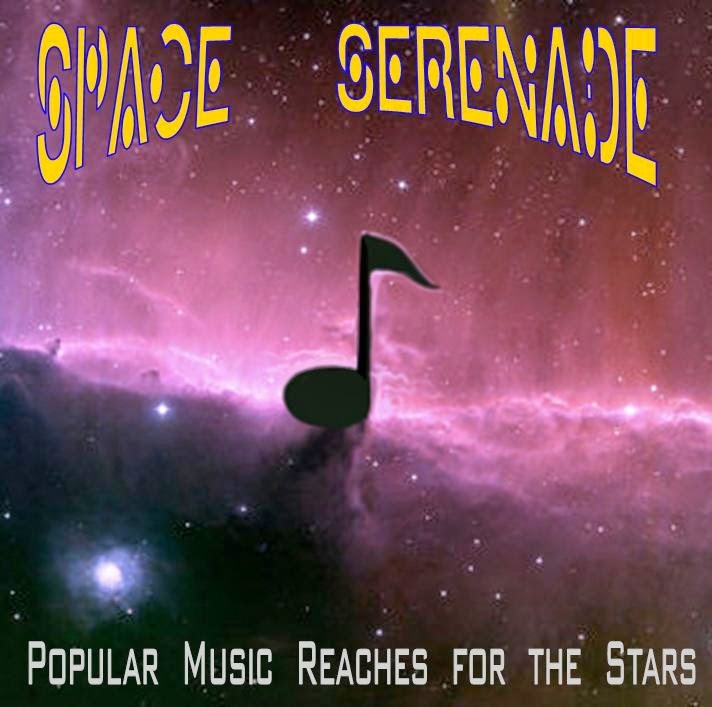 Another instalment in the musical "wonders of the universe" saga, this compilation includes songs from 1930s bluegrass to honky-tonk and postpunk. 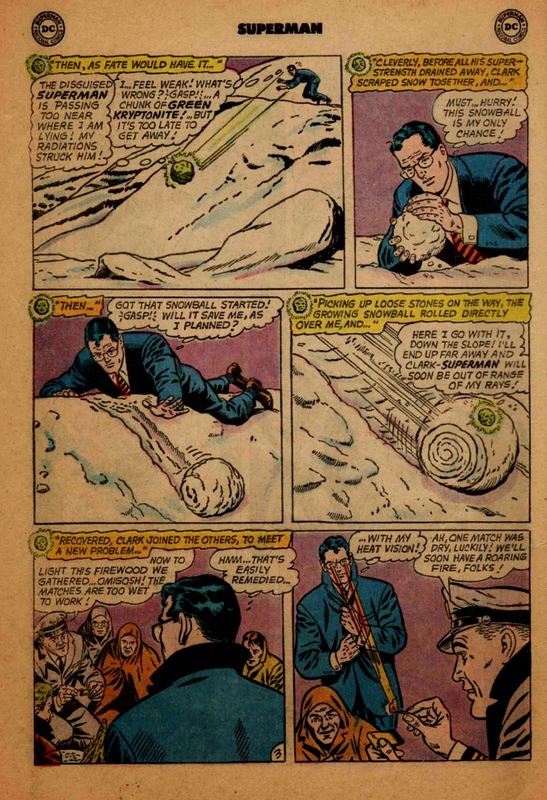 In this Tale of Green Kryptonite from Superman #176, our plot-device-narrator, a piece of Green K, has stricken Superman near the North Pole. After escaping its dire influence, the desolate location has inspired him the build his secret hideout, the Fortress of Solitude, here. I wonder if Superman decided to hide similar "airplane markers" around the world's other mountainous regions, so this one wouldn't be too distinctive. Not a bad suggestion, eh? The installation of those "jets of anti-biotic gases" seems like a good precaution. The more savvy of us begins to wonder what part of this set-up will prove to be the Chekhov's Gun for the punchline of this story. We can certainly assume that Professor Clyde's anti-radiation device, along with this tale's framing theme of Kryptonite, will soon occupy stage center. Isn't Panel One a great iconic depiction by the master, Curt Swan, of the Clark Kent-to-Superman transformation? And dig those crazy tongs! -- along with the oversized sledge hammer and giant shovel. Read carefully the rapid set-up to the payoff, given at the bottom of the page. Professor Clyde's ray has "changed the wave-length" of the Green K's radiations. We know this, because the piece of Kryptonite tells us it can feel it! And since the "flinch test" causes no bad feelings in Superman, in a few minutes Professor Clyde will send Kryptonite-changing rays ALL OVER THE EARTH. This seems a bit impetuous, don't you think? Even a grade-schooler might think that this is rushing things a bit. Wait and see! And how big will his upcoming bill from Metropolis Water and Power be? That kind of world-spanning broadcast will use a lot of energy! Maybe it will split the world like a Tesla Tower gone mad! Come back Friday to find out! Right past that regretful piece of Green Kryptonite! Quick thinking and a snowball toss saves him, and he helps get a fire going, with the last match. 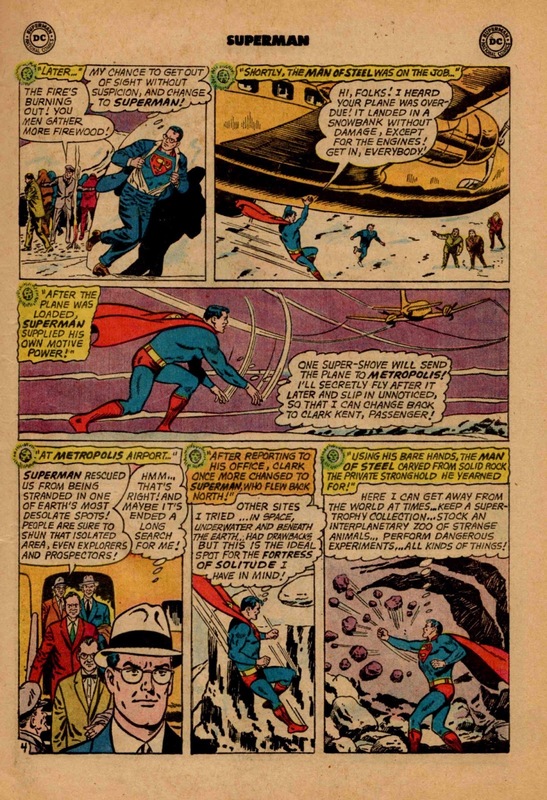 Of course, no airplane could be tossed like that; not only would Superman's hands sink into the plane like sticks into a marshmallow from the weight, but neither the plane nor its passengers would survive such a super-toss as depicted in the central panel, without a fatal "loss of integrity." But who cares? This is a comic book, it's a cool idea! 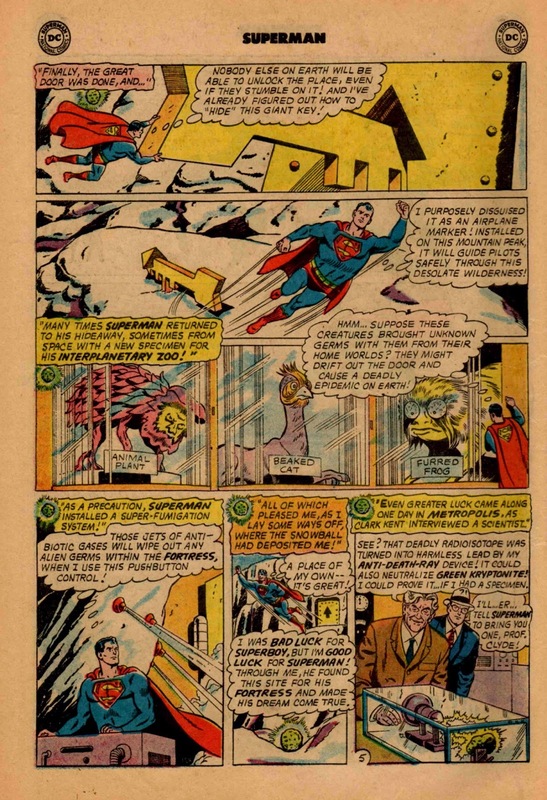 Now we see that this whole sputtering-plane, Green-K-encountering scenario is in fact a Silver Age telling of the Origin of the Fortress of Solitude! Note in Superman's thought balloon the references to previous locations for his secret hideaway. Don't those few lines look re-lettered? Maybe somebody had to re-adjust this thought balloon after consulting a few big-brained types. One of my heroes, E Nelson Bridwell of mine own Okie City, began working for DC as an assistant to Uncle Mort. He would have been the perfect person to ask about this sort of thing .... but I doubt that he was on staff when this story was prepped in fall of 1964. Tune in Wednesday for another few pages of this "Tale of Green Kryptonite"!